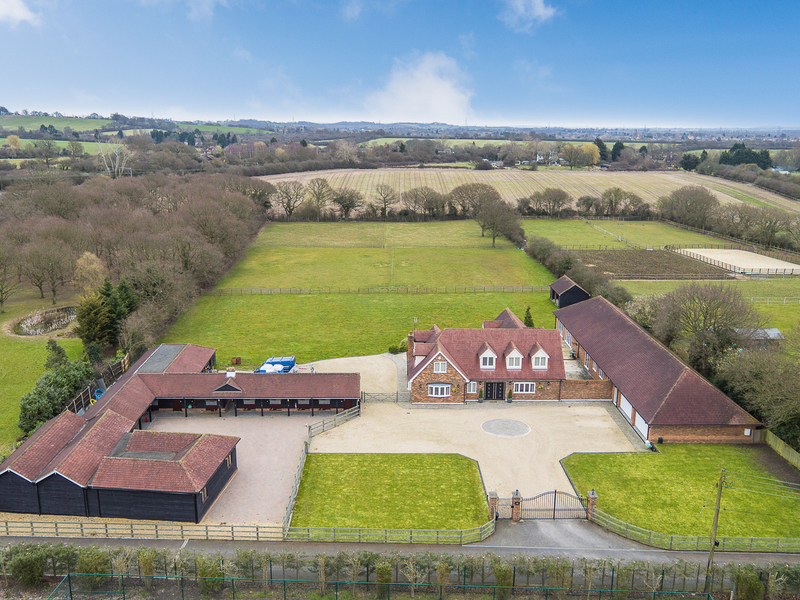 SET IN 5 ACRES (STS) private position in sought after Glebe Road Ramsden Bellhouse, family property with separate games/sauna/ bar room, large equestrian facilities all in immaculate condition both internally and externally garaging for several vehicles large driveway with security gated entrance. This amazing first time to the market property sits on approx. 5 acres (sts) in one of the best locations in Ramsden Bellhouse, with first class equestrian facilities, beautiful views to the rear, and a four bedroom, three bathroom executive property with the added benefit of a leisure complex complete with games/party room, separate gym, with two bathrooms and steam room, and large office with kitchen ideal for working from home, eight car garage, security gated imposing driveway with parking for several vehicles. Double composite entrance doors to the front aspect with feature inset obscure glass, and obscure windows to the sides, leading to an imposing hallway with polished porcelain floor tiles, smooth ceiling , coving inset lighting, video entry phone system doors leading to all reception rooms and cloakroom, stairs to the first floor. Obscure window to the front aspect, Smooth ceiling, coving, inset lighting, low level w.c. wash hand basin with tiled splashback and feature mirror above, radiator and tiled flooring. Half glass panel double doors leading from the main hallway, Bay window to the front aspect, French doors with side windows to the rear on to the garden patio, smooth ceiling , coving, inset lighting, feature stone fireplace with inset gas fire, three radiators carpet flooring. 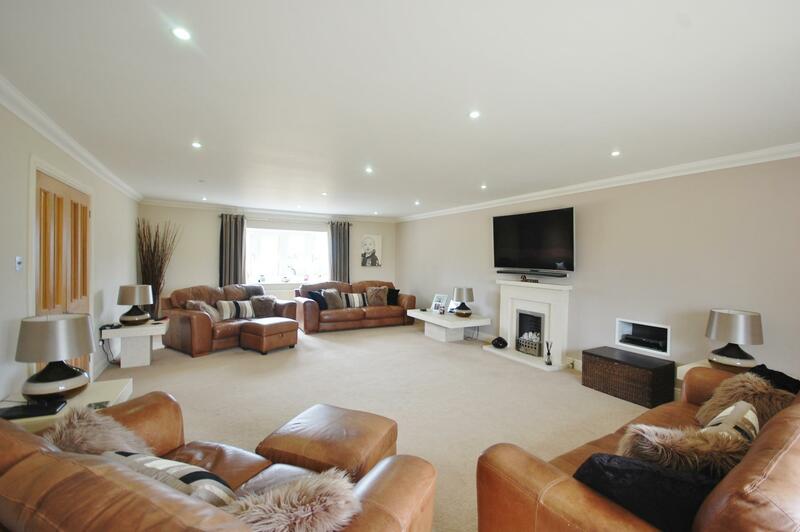 Windows to the front and side aspects, smooth ceiling coving, inset lighting, radiator oak effect flooring. Half glass panel double doors leading from the main hallway, window to the side aspect, smooth ceiling, coving, inset lighting, radiator carpet flooring. Beautifully proportioned kitchen/family room with the added benefit of being able to have large dining area, Half glass panel doors leading from the main hallway, one set of French doors to the rear garden patio, two windows to the side aspect and one window to the rear aspect and side door access, smooth ceiling, coving, inset lighting, underfloor heating porcelain polished floor tiles, range of base and wall units in buttermilk cream colour, including drawer units, integrated range cooker with extractor hood, Neff dishwasher, Neff microwave, Bosch American style fridge freezer, with storage cupboards to the top and sides, one and half bowl stainless steel sink incorporating waste disposal unit with mixer taps and hot water tap. Separate Island with storage drawer cupboards and wine cooler, breakfast seating area. Matching dining room table with seating for eight, ( will comfortably seat twelve) the kitchen area, island and dining room table all in contrasting brown granite. 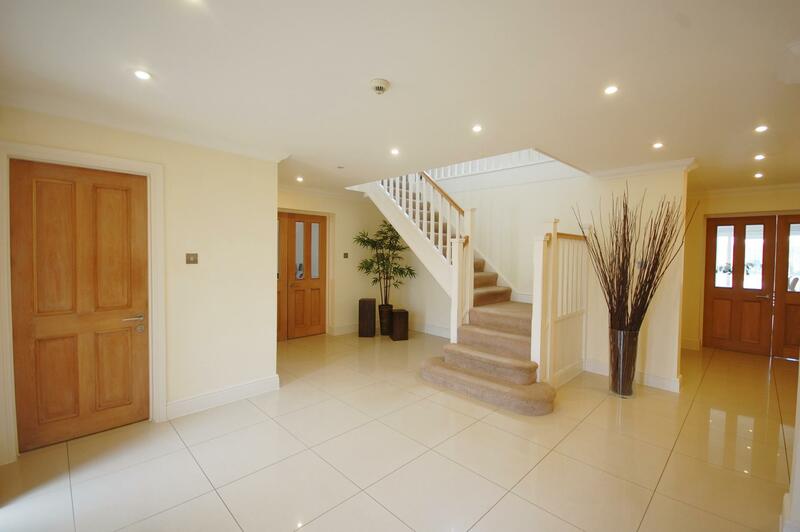 Door leading from the main hallway, Window and door to the rear garden, smooth ceiling, coving, inset lighting, range of bad and full length storage cupboards, one housing a wall mounted boiler, butler sink with mixer tap granite work surfaces, polished porcelain flooring. Stairs leading from the main hallway to a galleried landing. One Velux window to the side aspect and two Velux windows to the rear aspect, smooth ceiling inset lighting eves storage cupboards loft hatch, radiator carpet flooring. 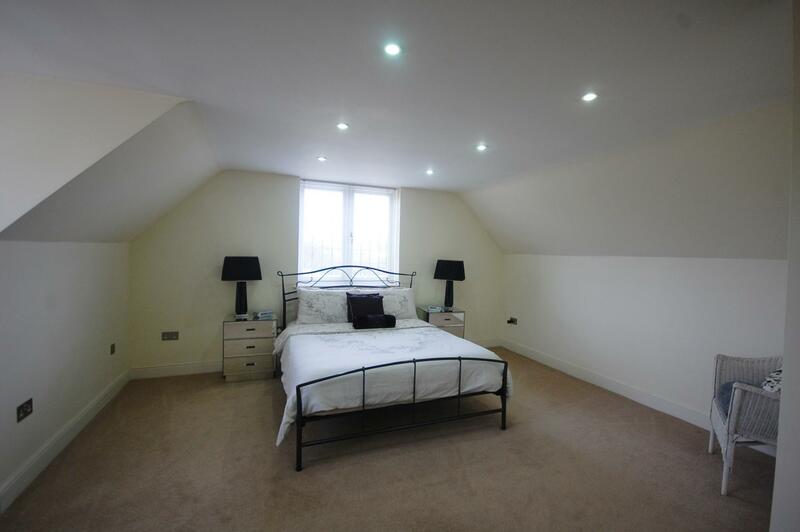 Main bedroom area with windows to the side and rear aspects, smooth ceiling inset lighting two radiators, carpet flooring, doors leading to the dressing room and en-suite. Obscure window to the side aspect, smooth ceiling, inset lighting, fully tiled walls and floor with contrasting mosaic tiling, low level w.c, wash hand basin with vanity unit with illuminated mirror above and storage cupboard, walk in shower area with large shower head and shampoo shower, heated towel rail. Fully fitted walk in dressing room with hanging rails, storage drawer units, shoe racks and storage shelving, smooth ceiling inset lighting radiator carpet flooring. Window to the front aspect, smooth ceiling inset lighting, radiator, two eves storage cupboards, carpet flooring door leading to en-suite and dressing room. Obscure window to the front aspect, smooth ceiling inset lighting, low level w.c. wash hand basin with vanity unit with illuminated mirror above and storage cupboard, fully wiled walls and floor with contrasting tiling, fully tiled shower cubicle. Fully fitted dressing room with hanging rails storage drawers and shelving wall mirror smooth ceiling inset lighting and added eve's cupboard storage. 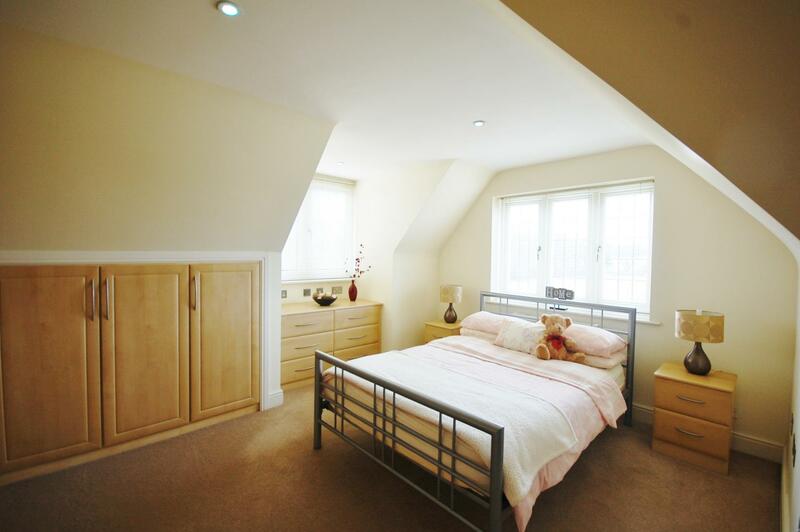 Windows to the side and rear aspect, smooth ceiling, inset lighting, range of floor to ceiling fitted wardrobes with matching drawer units and bedside cabinets, radiator and carpet flooring. Windows to the front and side aspects, smooth ceiling inset lighting, range of floor to ceiling fitted wardrobes, matching drawer units , radiator and carpet flooring. Leisure complex to the side of the property onto the patio area. 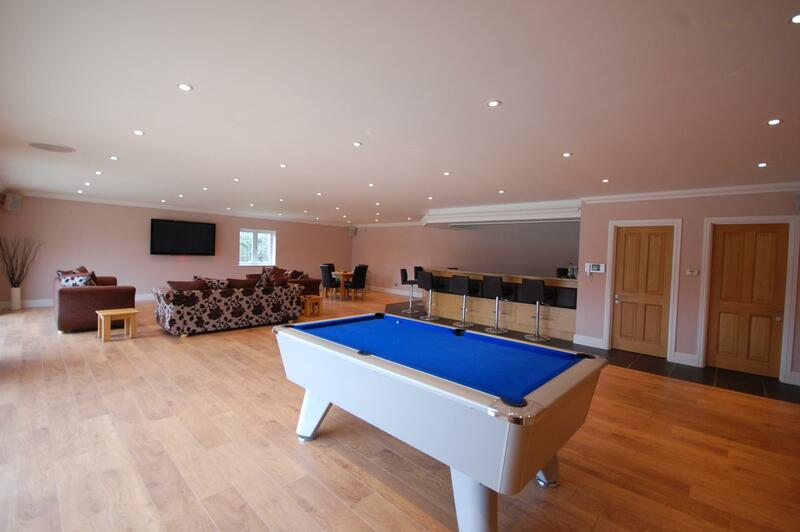 Ideal entertaining leisure complex, with window to the side aspect, and two sets of French doors to side the front on to the patio area, smooth ceiling, coving and inset lighting, bar area with wine and beer cooler, stainless steel sink, granite work surface, and large area for barstools seating for six, pool table area, and t.v family lounge area, video entry system. 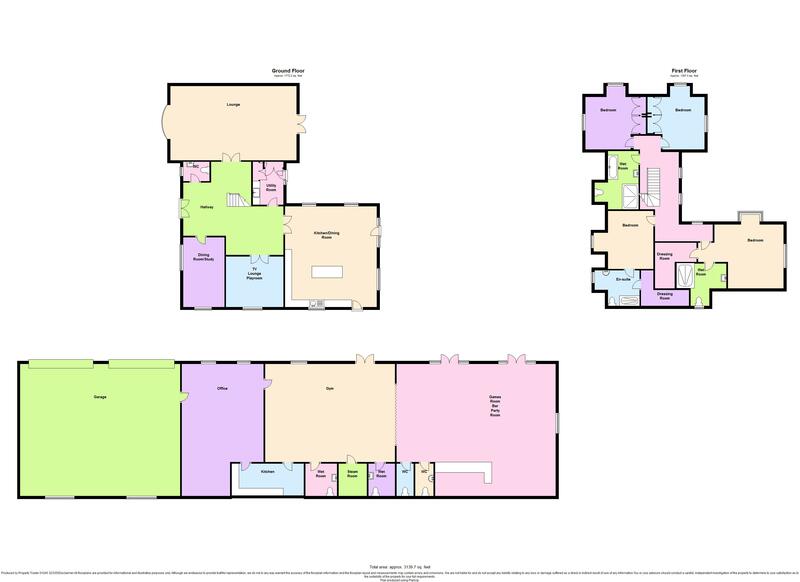 Under floor heating Oak colour flooring, folding oak doors to one end leading to the gym..
Two separate cloakrooms 7ft 4in x 3ft 9in, (2.2352 x 1.143) each one with smooth ceiling, inset lighting, extractor fan, low level w.c storage shelving, wash hand basin with tiled splashback and mirror above, tiled flooring, under floor heating. 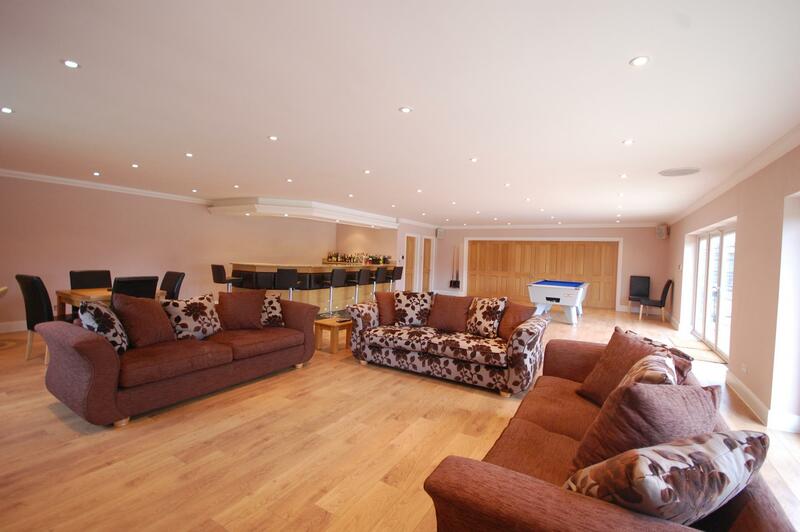 Large gym with doors leading to steam room, two wet rooms, and kitchen, French doors and windows to side aspect, smooth ceiling, air conditioning, coving, contract carpet flooring with underfloor heating. Door leading to office. Fully fitted and insulated steam room, with seating for seven people. 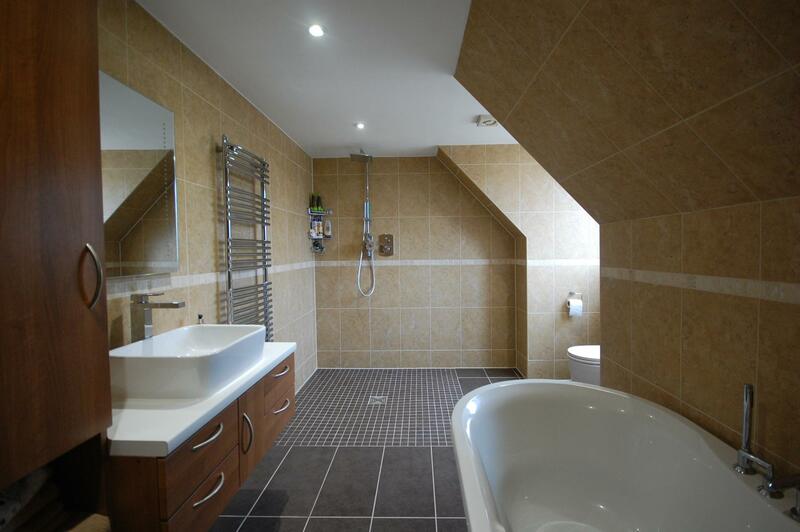 Smooth ceiling, coving, inset lighting low level w.c. wash hand basin vanity unit with feature sink and mirror above, fully tiled walls and floor with underfloor heating and contrasting tiling, shampoo holder and towel rack. Extractor fan. 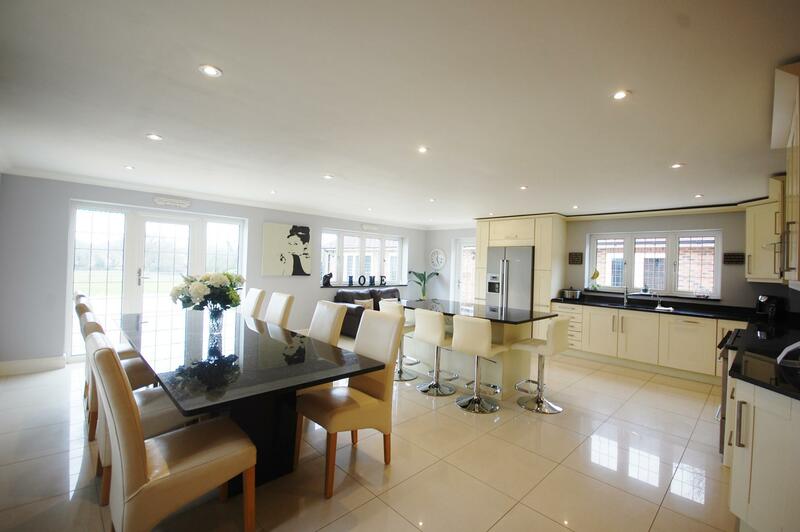 Smooth ceiling, coving, inset lighting range of base and wall units with pelmet lighting, including drawer units , stainless steel sink, contrasting work tops, under floor heating. Two windows to the front aspect, smooth ceiling coving, inset lighting loft hatch, office carpet flooring, door to kitchen and garage. Exterior to the front aspect. 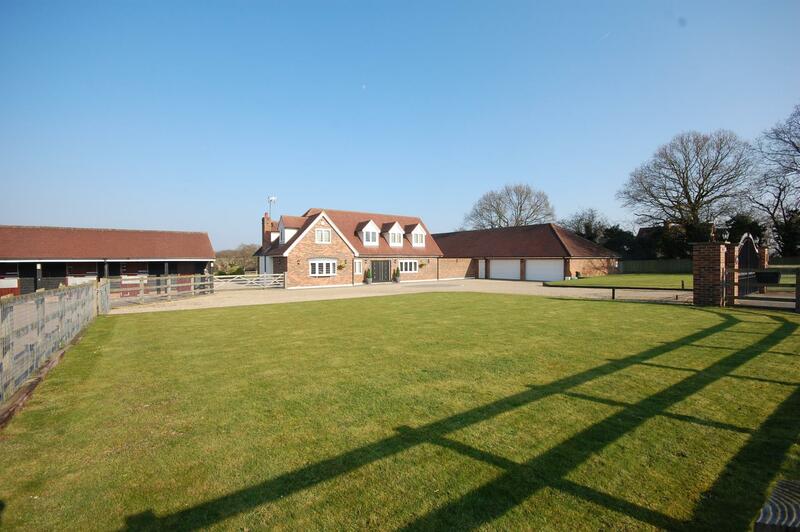 The property is approached via security gates leading to a large gravel and block paved driveway with two lawn areas to either side, leading to the front of the house, and the garage, a five bar farm gate leads to the rear and there is post rail fencing and a gate separating the stable block. 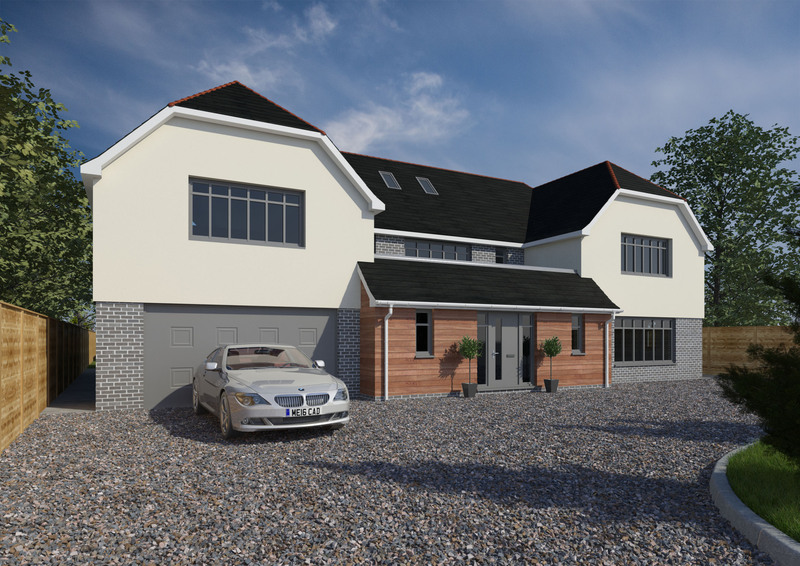 The two double electric doors lead to the eight car garage with two windows to one side, power and light wall mounted boiler and pressurised water tank for the leisure complex. 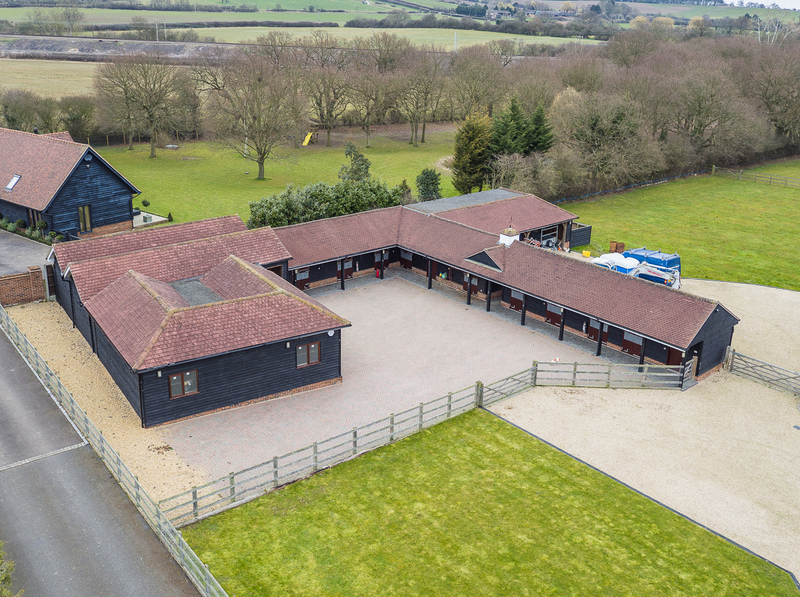 Very well maintained stable block with, Six single stables, two doubles, tack room, dog kennel, hay barn, workshop all with water electric and own circuit breaker. Utility room with stainless steel sink, plumbing for washing machine and power for fridge/freezer and toilet, dusk to dawn lighting. 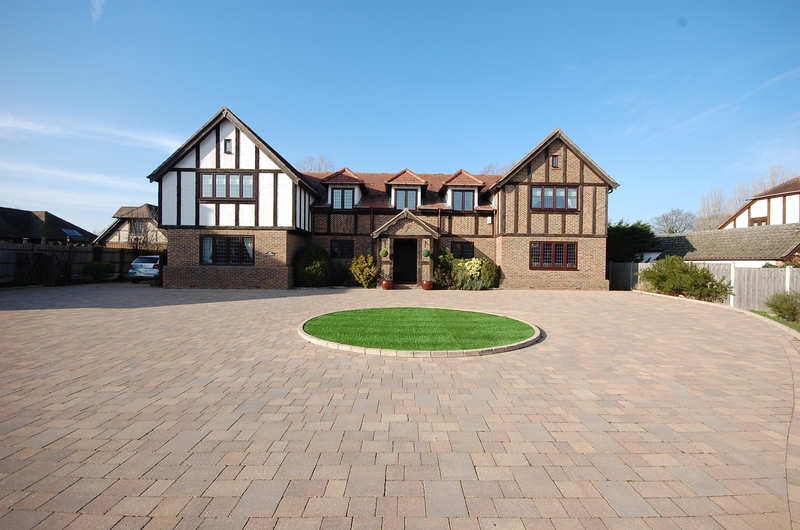 Block paving to the exterior of the stables and post and rail fencing. Exterior to the rear of the property. The property is set in approx. five acres (sts) with post rail fencing and extensive views to the rear, large sandstone patio to the rear of the house with steps to the garden and leisure rooms, feature block paved paths, various shrubs trees and plants, mower storage shed, cart lodge with parking for four cars, dusk to dawn lighting and tiled roof to the rear of the stables. Paddock have land drainage and water feeds to the paddocks. Paddocks can also be floodlit. All rooms have tv, telephone points and numerous sockets. These details cannot be relied upon to form any part of a contract, All interested parties must verify accuracy and your solicitor must verify tenure/lease information, fixtures & fittings and, where the property has been extended/converted, planning/building regulation consents. The information provided about this property does not constitute or form part of an offer or contract, nor may be it be regarded as representations. .
All dimensions are approximate and quoted for guidance only as are floor plans which are not to scale and their accuracy cannot be confirmed. Reference to appliances and/or services does not imply that they are necessarily in working order or fit for the purpose. 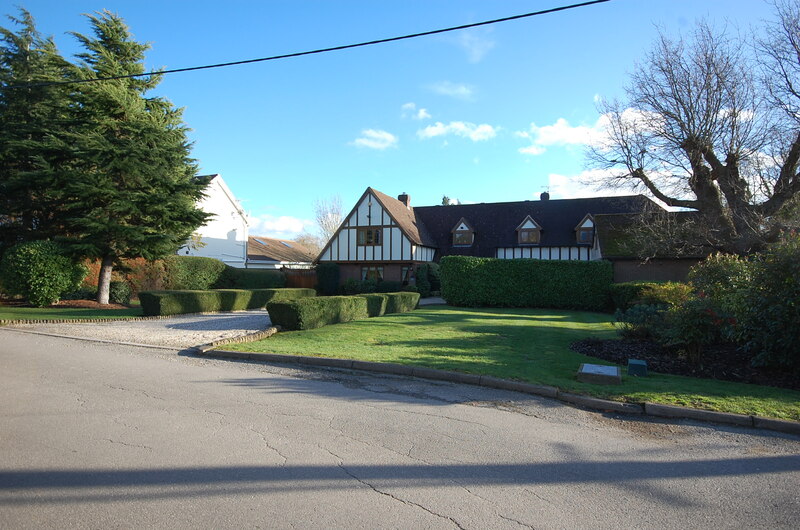 Bellhouse Estates is an independent , exclusive property consultancy with a wide knowledge of the housing market specialising in both New and Resale properties. We offer a a comprehensive bespoke service that is both professional and approachable which is of the utmost importance to both vendors and purchasers, our service is tailored to your needs.